MOVING sound has been added to moving pictures to bring greater realism to the screen. 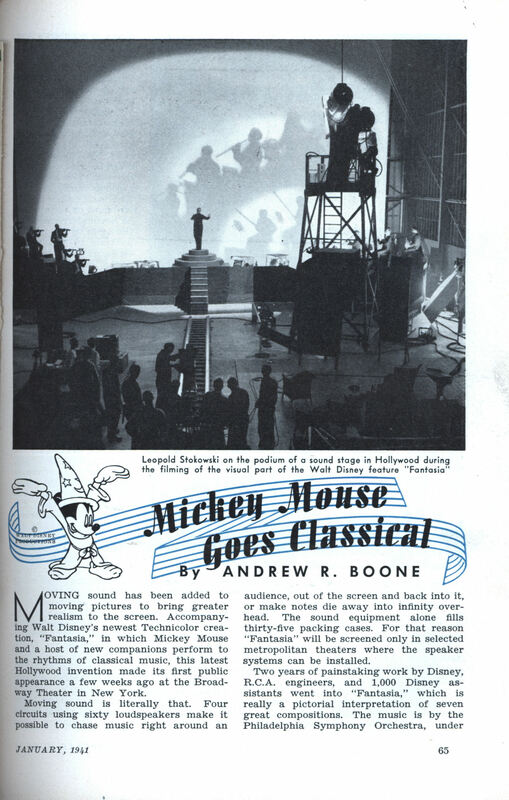 Accompanying Walt Disney’s newest Technicolor creation, “Fantasia,” in which Mickey Mouse and a host of new companions perform to the rhythms of classical music, this latest Hollywood invention made its first public appearance a few weeks ago at the Broadway Theater in New York. Moving sound is literally that. Four circuits using sixty loudspeakers make it possible to chase music right around an audience, out of the screen and back into it, or make notes die away into infinity overhead. The sound equipment alone fills thirty-five packing cases. For that reason “Fantasia” will be screened only in selected metropolitan theaters where the speaker systems can be installed. Two years of painstaking work by Disney, R.C.A. engineers, and 1,000 Disney assistants went into “Fantasia,” which is really a pictorial interpretation of seven great compositions. The music is by the Philadelphia Symphony Orchestra, under the baton of Leopold Stokowski. Deems Taylor, music critic and composer, aided in making the production. Behind “Fantasia” lies Walt Disney’s desire to always give the public something new and better than what they have known in the past. To achieve this effect, he knew that means must be found to spread sound throughout the theater, that “point sources” must be concealed from the ear. The sound recordings must be such that each and every instrument or voice would be heard clearly and distinctly in its proper proportion to the whole orchestral effect. The recording alone for “Fantasia” took almost eighteen months. Approximately 3,000,000 feet of sound track from individual takes, prints, and remakes were condensed into the final 10,778-foot, four-track negative. Neither Disney nor the engineers knew just where the experiment would lead when the 110 members of the orchestra first took their places on the stage of the Philadelphia Academy of Music early in April, 1939. Thirty-three microphones faced the musicians. From them nine channels carried the music to nine recorders set up in the basement of the building. Seven channels transmitted sounds from individual groups of instruments such as the wood winds and the violins. The eighth caught the complete orchestration, while the ninth carried the beat of a telegraph instrument which later enabled the animators in Hollywood to fit the action of “Fantasia” to the tempo of the music. Seven weeks Stokowski and the orchestra labored. All that time a second director faced the recording instruments, guiding the recording on film of each passage. From a duplicate score he brought choirs in and out, stepped up solos. Engineers tuned volume controls, guided by oscilloscopes which told them just how much sound was coming through their machines. Exactly 483,000 feet of sound track were recorded in forty-two days. Cans of film were shipped by air to Hollywood for processing. After that retakes were made where necessary to obtain exactly the desired tonal combinations of choirs, soloists, and instruments. Then came the problem of mixing these sound tracks into one realistic whole. 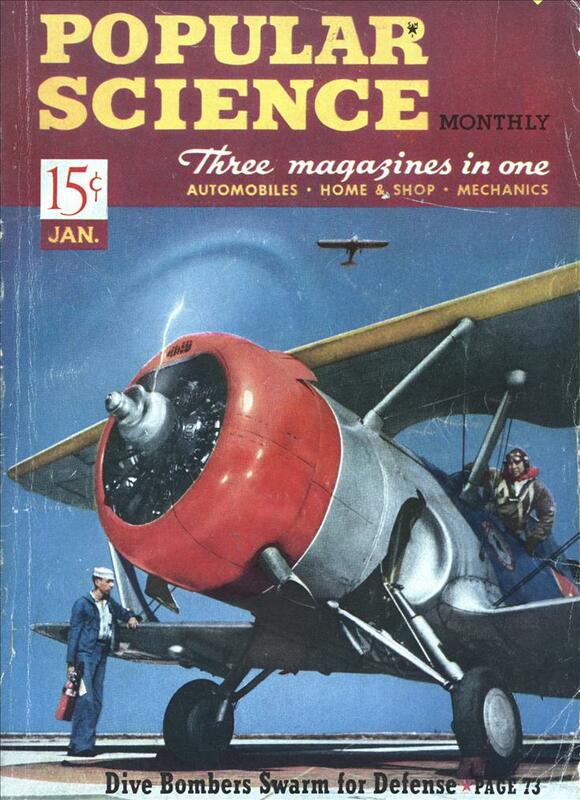 First the engineers tried multiple speakers fed by a single sound-transmission system. That spread the sound over a wide area, but when the characters spoke, the synchronization of words and lip movements was lost. There were further experiments before the producers were satisfied. The solution was finally found in combining the nine tracks into four; three for “entertainment sounds,” such as voices, music, and special effects, and the fourth for a control frequency governing the volume of the other three. Operators in the projection booths of theaters where “Fantasia” is presented will face no unusual complications. Their problems will be the routine ones of threading the film and focusing the picture. Fantasia actually was one of the very first movies in stereo. It went beyond stereo – it was multi-channel sound in some theaters. They were several decades ahead of their time. Unfortunately, modern audiences will never be able to hear what contemporary audiences heard in theatres; because in the 1950’s the original “Fantasound” tracks were transferred onto magnetic recording tape in such a way that the tape copies suffered from varying degrees of distortion and lessened sound-quality. Part of the problem was that the signals from the original optical sound elements were fed over telephone lines to a remote recording facility. In the process, a low-level hum from the telephone wires ended up on the tape copies. When Fantasia was restored for its 50th anniversary, technicians were able only to work with the tape copies (utilizing technical data from the Disney Archives to replicate the configuration of the original 9-channels) when remastering the soundtrack. The engineers did their best to correct any phasing problems and to erradicate some of the hum from the tape sources, but the restored 1990 soundtrack did not have the full impact of the original 1940 soundtrack. The original optical sound elements were lost in the intervening years. For the 60th anniversary “roadshow” edition that came out on Disney DVD in 2000, the voice of Deems Taylor had to be dubbed by an actor because the original voice tracks are still lost. Hopefully one day all of the original voice and music tracks might be found in useable condition and a new restoration of Fantasia might be done for release in Disney’s “Platinum Edition” series.